It’s a Thursday evening in August and I’m sitting outdoors in a field in Rutland surrounded by people eating Andalucian paella. It’s not how I imagined Birdfair would be. But then, I’m not sure what exactly I was expecting it to be like. 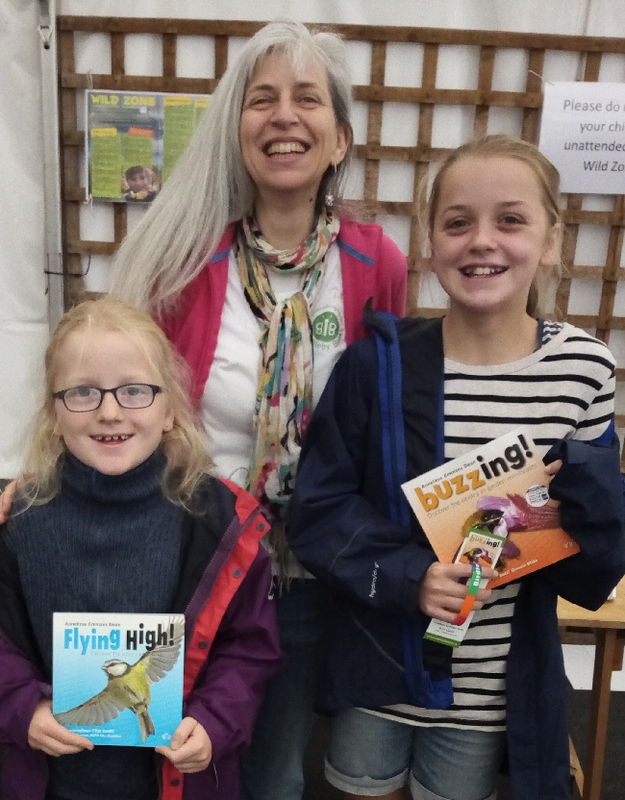 Around this time last year I replied to a comment on this blog about the lack of kids’ activities at an event called Birdfair. I offered my services. I put on interactive bird shows for kids to inspire learning through laughter, rhythm and rhyme. I fit the bill. One year later, here I am just returned from my first ever Birdfair, having put on three shows in three days. How was it for me? And, indeed, how was it for Birdfair, given that they created, for the first time this year, an area called the Wild Zone specially for children? Let’s start with the me bit. I’m not Chris Packham. (Early on at Birdfair I discovered that the unit of currency is the ‘Packham’: ‘I can help you. I know Chris Packham.’; ‘I gave a copy of my book to Chris Packham.’; ‘I got a photo of me with Chris Packham.’ I think I might be the only person to have attended Birdfair who didn’t get a photo with Chris Packham!) And I’m not on the telly (though feel free to invite me). So unless you’ve been to one of my live shows or bought one of my books, you won’t know who I am. Or what I do. So, here’s a snippet from one of the Flying High! shows I put on in the Wild Zone at Birdfair. 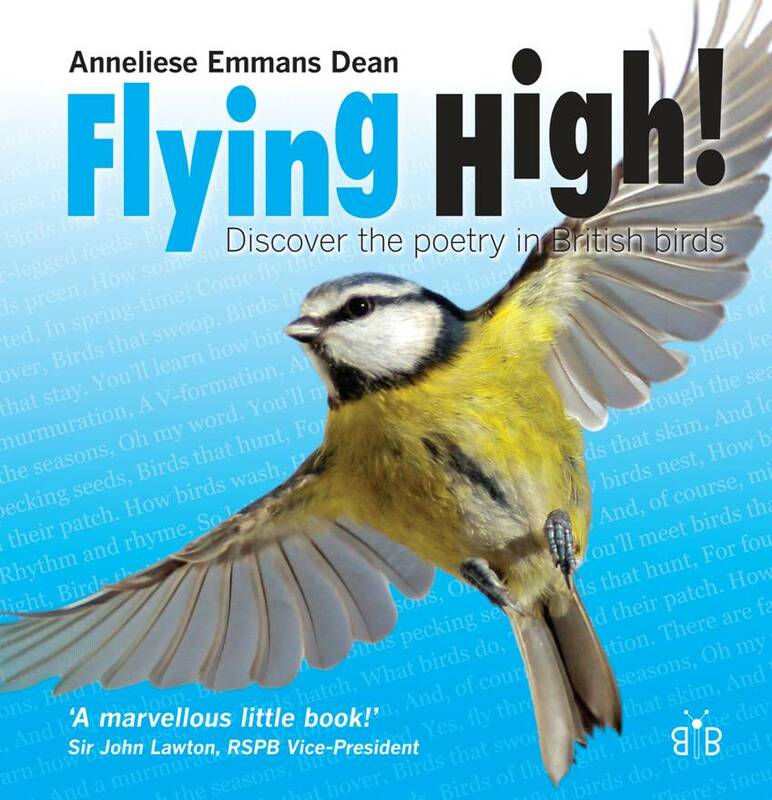 It’s the Mistle Thrush poem (‘Incubation, Incubation, Incubation’) from my award-winning Flying High! children’s bird book. The enthusiastic joining in and giggling by my audiences (the children and their accompanying adults) was a complete joy. Ditto their reactions, feedback and conversations afterwards at my book signings. But they weren’t fabulously huge audiences. Partly because, as I have mentioned, I’m not Chris Packham. But also partly because there weren’t a vast number of children at Birdfair. I’m not alone in having had relatively small audiences at the Wild Zone. I know of at least one event there to which no-one turn up at all. And another that had just three audience members. I think this is – appropriately enough for a bird event – partly a chicken and egg situation. Because in the past there haven’t been, as I understand it, many specific events put on for children, people tend not to bring their kids. Almost every bum on every seat at my Flying High! shows belonged to a child I had accosted (in the nicest possible way, with their parents present) and personally invited to come along. I approached every child I saw. And there weren’t that many. Hopefully things will improve in coming years, as word gets out that there are children’s events – indeed, a whole children’s area – at Birdfair. 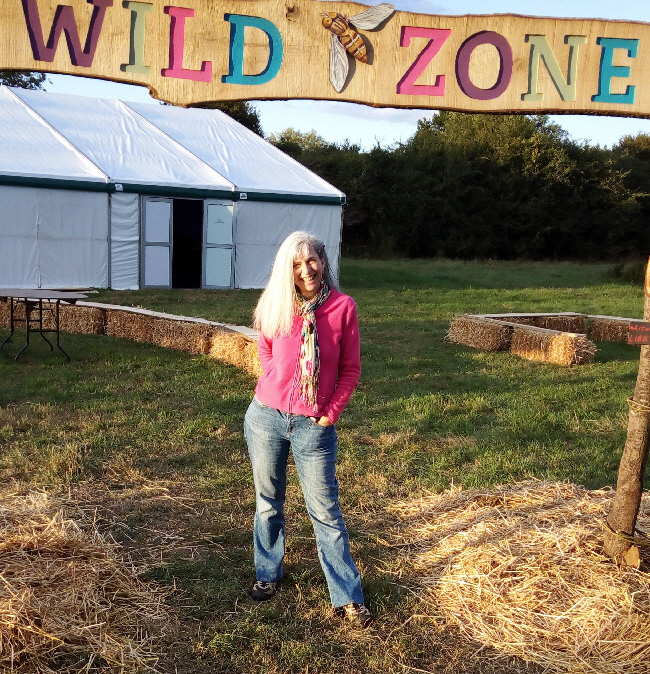 And the Wild Zone really was a great children’s area, with a host of free activities (led by lovely people) inside and outside the marquee, including willow weaving, clay modelling, colouring in, badge making, app demonstrations, plus the programme of speaker events. The gender balance in the Wild Zone marquee was good, with, in addition to me, Anya Wicikowski, Vicky Woodgate, Kate MacRae, Jess French and Lizzy Daly each presenting their own events. Of the five events between 3pm and 5.30pm on Saturday, for example, only one was by a man. But how did visitors find out about these Wild Zone events? Assuming they hadn’t been accosted by me, how did they know what to come and see, and when? Before coming to Birdfair, Mark Avery (he of this blog) gave me some top tips. One of them was to dress down (I’m very pleased I didn’t turn up in the rather elegant dress I had had in mind), and another was to look through the programme in advance and highlight the events I wanted to go to. I’m hazarding a guess that most of the people who looked through the programme to find the events they wanted to go to will not have seen the Wild Zone events, and so will have been busy doing other things in other places when our events were happening. That’s because the Wild Zone had its own, separate, double-page spread of events in the programme – after the end of the What’s on Sunday page. In other words, people will have closed the programme, having sorted their itinerary, before even finding the Wild Zone events. 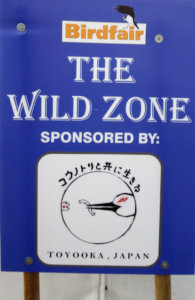 There was a consensus amongst those I spoke with that having the Wild Zone events listed on the main What’s on pages (in addition to having their own spread), would have meant more people would have known we were there. The consensus amongst all the people I spoke with about the Wild Zone in general was that it was A Good Idea, but that it would need time to bed down and for people to get to know it was there. Consulting with those who worked there over the three days would yield useful feedback to improve it further in future years. All the people I spoke with … Goodness me, I spoke with an enormous variety of people at Birdfair. That was one of the unexpected joys for me. By the end of the first day I had had conversations in five different languages. Well, that’s not entirely correct. Conversations in four languages, and mini-interactions in one, i.e. my long-unused, dredged-up Japanese. That was with the Mayor of Toyooka, Japan, whose city had sponsored the Wild Zone and whose extraordinarily inspiring film about the reintroduction of Storks into his region literally made grown men in the Wild Zone cry. Conversations, conversations, conversations. And extraordinarily serendipitous meetings. Recounting them all would take several more blog posts. But for the purposes of this one, let me just say that being able to interact with a wide range of bird-interested people (from those you sit next to randomly on a bench to those running a stand you happen to pass to those you queue up a long time to talk to) make Birdfair a very stimulating and inspiring environment for kids. Which is why I hope that more and more kids will come (or rather, will be taken there) as word gets out about the events (erm, and the chocolates) put on for them. The chocolates? I didn’t know about them until one little girl proudly showed me all the chocolate freebies she had accumulated from various stands. She was a pro, having been to Birdfair in previous years. She knew exactly which stands to head to for chocolates! The following morning I opened my curtains to be greeted by a sight in my little garden that I’d never seen in the 22 years we’ve lived here: juvenile Bullfinches (on our seed feeder). And my heart sang and my spirits soared. Which is what birds are all about for me. It’s why I do the work I do, getting children (and adults) tuned in to the birds around them, through laughter, rhythm and rhyme. As anyone reading this blog will surely already know, there’s a lifetime’s pleasure to be had for them as a result. "my heart sang and my spirits soared. Which is what birds are all about for me." If just a few of the children who attended your events discover a similar response in themselves as a result, your time will have been well spent. 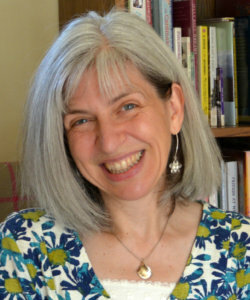 Great blog Anneliese. Next year Bird Fair should have the good sense to advertise your show properly – kids are their next set of customers here on out. It’s called the profit motive. And then there’s that minor point about children: they are the world’s next main hope. The Bullfinch family, were they calling to one another? There’s a tendency to hear Bullfinches more than see them. But they can also do prolonged silences through the year. That’s just an aside, but I get the feeling that we don’t get children to listen enough to nature. Yes, it’s good they do lots of hands on and watching stuff but they also need to be prompted to wonder at the soundscape too. Absolutely agree Murray - tuning children (and adults) into the *sounds* of nature is very important. My Flying High! shows include audio of birdsong (including getting the children to guess the bird from their song). I defy anyone who was at my shows at Birdfair to leave *without* knowing what a Chiffchaff sounds like! And on my website I have a page with the songs/calls of each of the birds that appear in my Flying High! book (https://thebigbuzz.wordpress.com/books/flying-high/birdsong/), and I flag this up to people who buy the book. As for our juvenile Bullfinches (and the female who subsequently turned up) - no, they were being their usual strong, silent types! It's great that you’re doing all that on the sound front for kids – all power to you. According to Tim Birkhead (Wisdom of Birds) Bullfinches are highly strung – apparently ringers don't like to handle them cos they can die of shock. And he says that Bullfinches are very faithful which might explain something of why their quirky ‘pan-pipe’ song is so rare in some places or in some years. Too much for young’uns? No, the more mysteries the better. We spent a delightful 20 mins or so, sitting on the bales of straw by The Wild Zone. The kids were having a great time. Just listening to Incubating, Incubation, Incubation on Facebook, brilliant. Oh that's very heart-warming to hear, Richard! Apologies, predictive text changed the name of your poem! I became an instant fan of the WildZone. Great lineups, lovely activities, a little safe oasis of creativity and wonder in a jungle which I know also offers those things, but in WZ they were less obscured by commercial and promotional clutter. My seven year old absolutely LOVED it - and you - though I'm afraid I missed you. As half of a parental tag-team, I was probably watching Chris Packham... no I'm joking. I'm pretty sure I wasn't, in fact I saw fewer talks this year than ever, but as you have described so well, BF is an amazing environment and it's almost impossible to move from place to place with out seeing people you just can't not stop and talk to. I'm so glad you enjoyed it and hope you'll come again! Oh I'm so very very pleased to hear your son enjoyed Flying High!, Amy-Jane. And the Wild Zone in general. I'd love to go again - if they invite me! Meanwhile, keep up your good work! I love the phrase in your article in the Birdfair programme 'birds are my constant companions and familiars'. Describes my life to a tee. Having read this inspiring blog I next read this in today's Guardian, very depressing but well done Wales! I'm pretty sure the kids appreciate the meaning of the yellow dung-fly's scientific name - "poo-eater of dung"! "the word children are used to"
Why? Whose idea was that? Has the profession of Nitty Nora been downgraded to Minibeast Explorer? I became aware of the term several years ago and the person whose use of it mildly annoyed me couldn't comprehend why it was an unnecessary dumbing down and was a term children would need to unlearn within days if they wanted anyone to understand them outside the school gate and apart from and because of that they would have no respect for anyone who used it at them. It's patronising, treats with condescension, looks down on, talks down to, puts down, humiliates, treats like a child, treats as inferior, treats with disdain, treats scornfully or contemptuously, is snobbish. Even C Packham agrees with me - my street cred will be in tatters. And everyday anthropomorphism should also be kicked into the long grass. It may help sell books and that kind of cuddly stuff but it doesn't help to develop the critical faculties of young people. Wow you are one inspiring lady. I loved your poem and they way you acted it out - spot on! I need dates for next year's Bird Fair so I can hopefully bring along granddaughter who will be visiting England & her family here from the US, where she, parents and her brother live. This year we missed Bird Fair as gthat weekend I was singing with my choir at the Edinburgh Fringe (note, no Chris Packham disraction there!) and they were all visiting the French side of the family in Bordeaux. Granddaughter has become keen on birds and I was thrilled to hear how she was able to correctly ID British mallards, coots & moorhens when we went to our local mere. I really hope you're back next year, and that we'll see you there. Off to check out your books now....! Thank you for your kind words, Joyce. Hope your singing went well at the Fringe! Sounds like your granddaughter would have enjoyed our Mallard vs Great-Crested Grebe poem. Fingers crossed we'll both be there next year, and she can join in then! I commented on an earlier blog Mark posted, but to reiterate, in summary, am amazed that it took till 2018 for the Bird Fair to create a bespoke space for kids. We happened on the Wild Zone by chance, after my wife and I decided to come. Our kids, aged 9 & 6, spent approximately 3 hours in the Zone over an afternoon and a day engaging with the activities and came away thinking the Fair was brilliant. Then youngest went straight up to Jess French, without hesitation, and said I know you on the telly. Thus, a wonderful 10 minutes or so was spent with Jess talking with Niamh and Caitlin. The point I make is that the Zone provides a focus for kids, their parent(s) and slightly more famous adults (parents) to interact. Superb. Great blog. Really heartening to read. I do think the Birdfair has suffered a gradual downward spiral of knocking off 'peripheral' activities until it has reduced to just the well oiled core. For example, if the kids stuff gets fewer kids, there is less incentive to do kids stuff and hence fewer kids come the next time out etc etc. That well oiled core works for a while but eventually reaches a tipping point and from the conversations on the blog, that seems to be arriving. The wild zone is a great idea and should be the start of building up the fair for both curious locals (who, from what I saw, often used to come in numbers on the Sunday but less so now) and youngsters. The birdfair team do a great job but they are a small team. To move forward with the wild zone, we need to promote the fair heavily in the junior magazines of the RSPB and Wildlife Trusts. All part of both organisations taking a more active role in 'their' bridfair and using this as a great tool to create the conservationists of the future.. Thanks for that contribution, Mjc. Pleased you enjoyed my post. Promoting the Wild Zone in junior magazines of the RSPB and Wildlife Trusts is a good idea. (Happy to write something for them, if they'd like ...) Also, your mention of 'curious locals' makes me wonder if outreach work is done in local schools before the summer holidays. If the kids knew about it, they might encourage their parents to bring them along. The parents I met there were very chuffed to discover that their children got in free - something to shout about in publicity, I'd say. As far as I can see on the birdfair website ticket page (https://birdfair.org.uk/birdfair-entrance-tickets/) this isn't mentioned. Indeed, children aren't mentioned there at all.